Do most carriers from countries with non-Roman alphabets use multiple languages on their branding? Which ones do and which don’t? At least livery-wise, none of the Japanese carrier have any non-Latin (Roman) alphabets in their branding (ANA even have their slogan "Inspiration of Japan" written in English). KE and OZ doesn't have any Hangul in their livery, either. The major airlines in Thailand doesn't have any Thai Alphabet in their logo/livery, either (referring to TG/WE and Bangkok Airways; I didn't check any of the smaller airlines yet). (Mainland) Chinese Airlines, along with Airlines from HK (i.e. CX/KA/HX/UO), Macau (NX), and Taiwan (CI/AE/BR/B7/FE) used both Chinese (character) and Latin Alphabet in their branding. Most airlines in Arab World AFAIK used both Arabic and Latin Alphabet. LY (El Al) has both Hebrew and Latin Alphabet. In Russia some airlines has Cyrillc alphabet on their branding (i.e. Aeroflot), some doesn't (i.e. Utair, S7). ANA used to have kanji in their livery but removed it sometime around 2003. But as far as overall "branding" goes, ANA, JAL and probably all the other airlines mentioned use plenty of examples of their native languages and alphabets in their overall branding. Just not in their liveries, which are a large part of an airline's branding, but definitely not all of it. 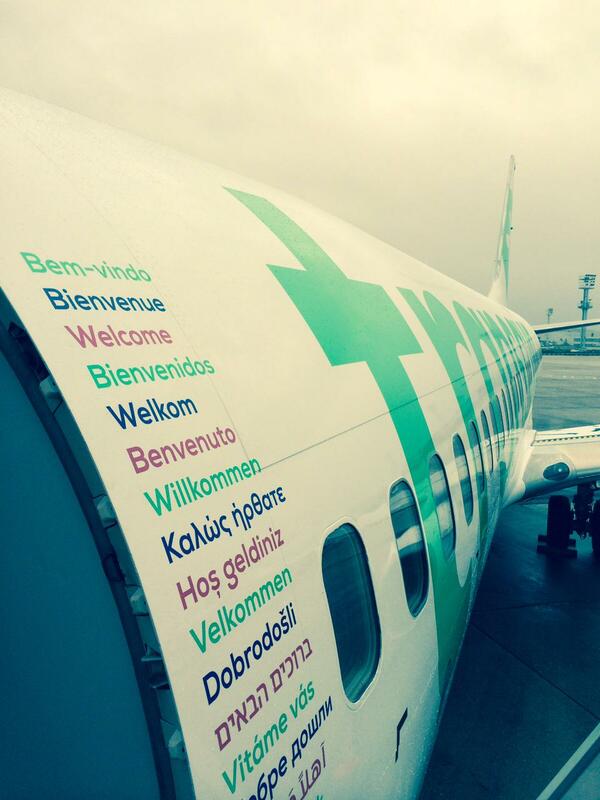 So I'd say nearly all, if not all, airlines with non-Roman alphabets use multiple languages in their branding. If there are any that don't, they're probably regional airlines that don't fly to countries that use any other alphabet (as used to be true of ANA). Not exactly branding but still multilingual is Swiss. They use German, French, Italian and Romansh on their ”Welcome“ screen. I never flew outside of Europe with them, but within Europe they use German, English and French for most of the stuff on board, too. Westjet and Air Canada use English and French liberally in their branding, though AC is probably better at using it in the cabin. It is what happens when you fly in a legally bilingual country. A related addition to this - Canadian (Canadien in French) Airlines uses the red Chevron in place of the 'a' or 'e' in Canadian/Canadien as the alternative to going full bilingual. Basically all Russian airlines except for S7 do. SU, DP and a couple of others have one side with Russian writing and one with English. Ukraine International Airlines had their name written in Ukrainian underneath the English writing on the fuselage. I certainly miss kanji/symbols on carriers like ANA and EVA; made them look more foreign and less “globalized” with just English titles. You didn’t have to look for the flag to figure out which country (or rather continent) it was coming from. I recall that South African had two sets of titles on their old livery. One side of the aircraft was in English read “South African Airways” and the other in Afrikaans read “Suid Afrikaanse Lugdiens”. Morocco, Algeria, Tunisia, Libya, Egypt, and so on...…. 7T-VAL Air Algerie (dual presentation on both sides; however, the earlier scheme (1960's) featured Arabic written "first", whereas the later scheme shows French first. A curious fact that is not strictly part of your question, is that airlines such as Thai International, whilst displaying purely English titles, would write the aircraft name in Thai on one side, and English on the other.